Modern Love (single edit, video). Modern Love (Live Aid, 1985). Here comes my Chinese rug! EMI’s (reported) $17 million contract with Bowie was one of the last good bets that recently-dismembered label ever made, as Let’s Dance repaid EMI’s advance within the year. It moved some six million copies (reportedly EMI’s fastest seller since Sgt. Pepper), hitting #1 in the UK and #4 in the US, and spawned three global hit singles. 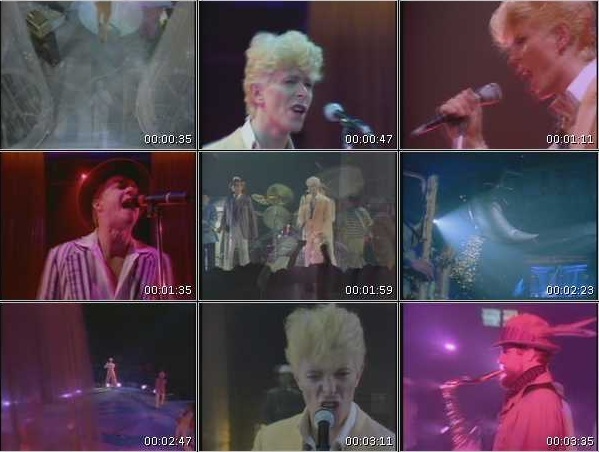 “Modern Love,” released in September 1983, was Let’s Dance‘s clean-up hit.2 And in its video form, “Modern Love” was a recapitulation of recent triumphs, the promo consisting of shots of Bowie working an adoring audience (in Philadelphia, Bowie’s go-to city for live recordings/footage). 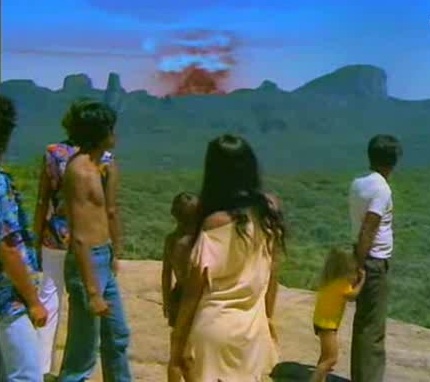 It was a rock video as tour commercial—don’t miss the giant inflated crescent moon! the horn section wearing pith helmets! Coming to your town next month! But the actual song was more compromised. 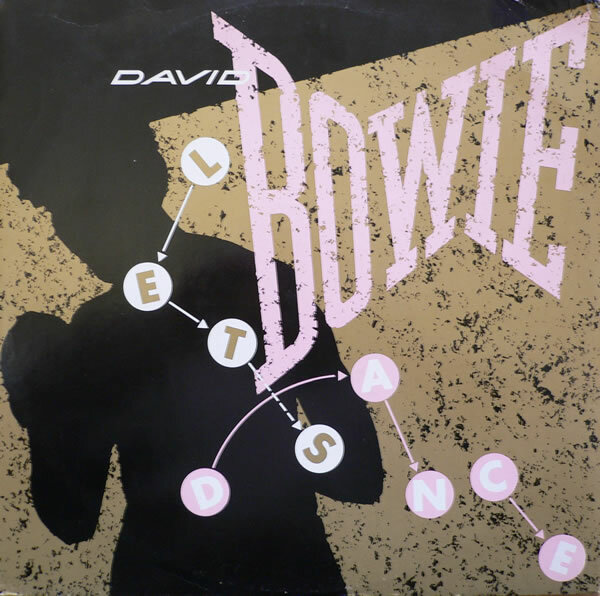 The ebullient lead-off track of Let’s Dance, “Modern Love” is a Bowie cultural doom-piece like “Five Years” recast as a boogie, nihilism in the high key of Little Richard. 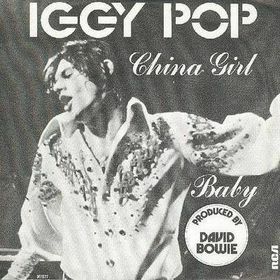 Bowie said the track’s call-and-response vocal arrangement “all comes from Little Richard,” Tony Thompson’s drumming seems like a gated update of Charles Connor’s barrage on “Keep a Knockin‘,” and Rob Sabino’s piano, though unfortunately sunk in the mix, is indebted to both Little Richard and Johnnie Johnson, Chuck Berry’s pianist. The Kinks’ “Come Dancing,” released a month before Let’s Dance was recorded, has some affinities with “Modern Love,” not just in its throwback sound. “Come Dancing” recounts how rock & roll killed off the light pop jazz of postwar Britain—how the liberated Sixties buried the Forties, for good or ill. In “Modern Love,” now rock and roll is the old, endangered music, coasting on past glories, recreating itself in lesser forms. Whatever transcendence the music once offered is gone, leaving just fading colors and noise, the false consolations of memory, revivalists shining up the relics of an emptied kingdom. 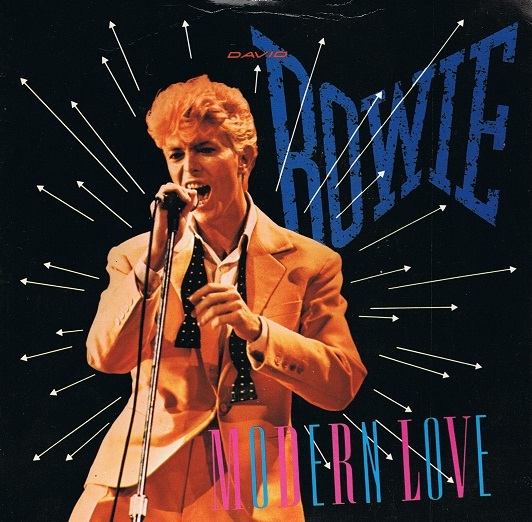 Lyrically, “Modern Love” seems a revisit of “Soul Love.” In the earlier song, Bowie considered “love” as an abstract force (in his wonderful line “sweeping over cross and baby“), one that consumes lovers, priests and mothers, a force as delusive as it is powerful. “Love” in “Modern Love” has an even more astringent quality—there’s something sharp and cold in Bowie’s use of it here. In “Modern Love”‘s circular 24-bar chorus (repeated three times in all), with its equally cyclical chord progression of the first four degrees of C major (C, D, Em, Fmaj7), Bowie starts out trying out “modern love,”4 finds it wanting, and takes solace in traditional marriage (“church on time”). But tradition’s just as empty, so he puts his trust in humanist religion (‘God and man!”) and finds that equally barren. (These moves are echoed harmonically by the fall back to the tonic, C major, with each new disappointment). The chorus closes with an echo of John Lennon’s “Imagine” and “God,” Bowie checking off everything that’s failed him—no religion, no confessions, no love. Nothing means anything, nothing works anymore. So the chorus ends back where it started, on “modern love,” because it’s the most appealing of the false gods. Yet while the first verse opens with another image of empty circularity, Bowie buying a newspaper that only tells him there’s no real news, there’s also a weak sense of effort, of pushing back, if passively: standing in the wind, lying in the rain. But I try. I try. Bowie’s spoken opening lines are the only real counter-force: I know when to go out. I know when to stay in: get things done. It’s like a condensed shareholder’s letter. This was Bowie recasting himself, yet again: here as a dedicated counterfeiter for a debased time (“it’s not really work, it’s just the power to charm,” he smiles—how others must see the faker), as a man bled clean of his former vices and now ready to go to work. “Modern Love” opens (in 6/8 time) with Nile Rodgers’ stuttering guitar riff, like someone trying to tug a motor into life, and it’s soon echoed on Tony Thompson’s drums. Thompson’s excellent on this track, with his subtly alternating patterns on every other bar. Carmine Rojas’ bass mainly holds the low end, with a few murmured commentaries at the end of verses, while the horns, as if they’ve been penned up, start chugging to go as the second verse ends. Bowie’s vocal is one of his strongest on the record—he never doubts himself, despite what he encounters; he’s determined to sell you through it. And for once the Simms brothers and David Spinner, who sound like a demented glee club on most of Let’s Dance, are put to good use, here serving as audience surrogates, chanting back whatever words Bowie feeds them, being driven along before him. “Modern Love” soon became Bowie’s encore set piece, with Bowie using the “never wave bye-bye” line literally, and he began to sing the entire piece in an excited, agitated manner. But the studio version slowly builds, with Bowie holding back until, having gone through his circle of disappointment yet again, he finally accepts the inevitable—that when there’s nothing of value left, one must accept nothing, and work at it. “MODERN LOVE!” he starts yelling, fully caught up in it at last. “WALKS BESIDE ME! WALKS ON BY!” (yet another old song churned up in the mix). Everyone’s borne along: the manic singers, the frantic horns, Tony Thompson crashing his cymbals. The fade comes while everyone’s still dancing in the circle. The bright communal joy of “Modern Love” masks a spiritually empty view of life, in which work is the last religion standing. As such, it was a song made for its times. Recorded ca. 1-20 December 1982, The Power Station, NYC. Released as a single (EA 158, #2 UK, #14 US) in September 1983. 1 These estimates are from George Tremlett, the Bowie biographer most keen on the money angle. Tremlett noted that since Bowie was a Swiss resident at the time, he likely paid a mere $10,000 in taxes on his alleged $50 million haul. 3 In Bowie’s later live versions of the song, especially the Earl Slick guitar-heavy incarnation from the last tour, the “Lust for Life”/”You Can’t Hurry Love” beat is pretty obviously there too. 4 The concept of “Modern Love” itself is a bit of a joke, as it’s as old as “modernity” itself (see George Meredith’s 50-canto poem of the same title, from 1862). I’m gay and always have been, even when I was David Jones. David Bowie, Melody Maker, 22 January 1972. The biggest mistake I ever made [was saying] that I was bisexual. Christ, I was so young then. I was experimenting. David Bowie, Rolling Stone, 12 May 1983. In the early Eighties, there was a collective denial of bisexuality/homosexuality among a generation of rock musicians. Lou Reed put out a few occasionally uxorious records, one of which had a song whose chorus was “I love women.” Freddie Mercury and Rob Halford kept to their closets. Elton John even married a woman. Then there was Bowie, who, in the notorious Rolling Stone “David Bowie Straight” interview in May 1983 (coinciding with the release of Let’s Dance), denied that he had ever been gay. He said much the same to Time two months later, calling his admission in 1972 “a major miscalculation.” It was the end of Bowie’s “gay” years. Never mind “John I’m Only Dancing” or “Rebel Rebel”: the new Bowie was pure hetero, a ladies’ man. This betrayal, if one could call it that, came at a cruel time. 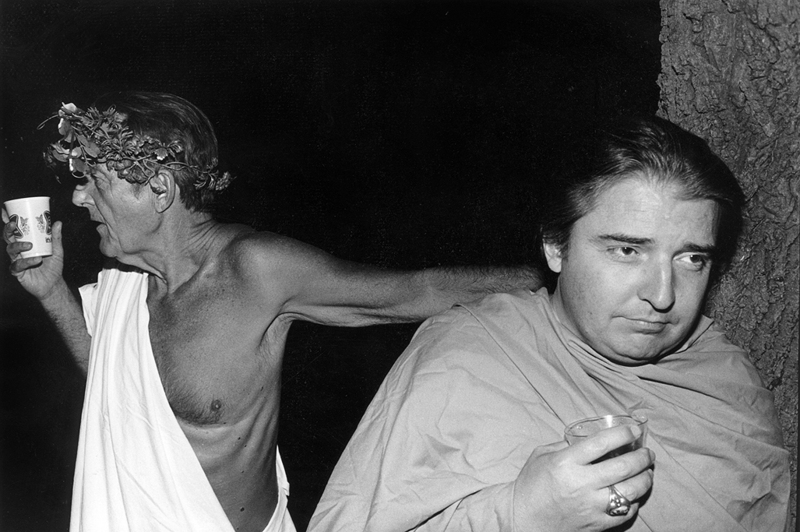 By 1983, AIDS, wreaking hell through gay communities, had become the source of lurid speculations and lunatic theories. I was an 11-year-old boy in the South at the time, and I recall what was said, by adults, not just kids: that you could get AIDS from doorknobs and toilet seats, that angry gay waiters were spitting their AIDS-tainted sputum into your food, that homosexuality was inseparable from filth and disease. Kushner’s Angels in America comes out of this period, as does James McCourt’s wonderful Time Remaining, an elegy for a culture annihilated. So Bowie, a man who once worn dresses on his LP covers, who once sang to a cross-dressing kid “hey babe, your hair’s alright,” now seemed to repudiate a culture that had once revered him, and at its bleakest hour. As I’ve written before (see the “John” entry), Bowie apparently wasn’t gay, rather being a mild bisexual who exclusively chose women for long-term relationships. As early as the Young Americans era, he had stopped playing, as the Melody Maker described him in 1972, a gorgeously effeminate boy…camp as a row of tents, with his limp hand and trolling vocabulary. And as I’ve said before, I don’t care to delve into the gossip of who he slept with. But what did Bowie owe to gay men? He had trafficked in their culture, had pretended (even claimed) to be one for several years, and gays had been some of his oldest and most loyal fans. Had he just always been an opportunist—and, to bluntly put it, being gay in 1983 was no longer “cool,” but rather something to be avoided? But go back to Let’s Dance. Tucked away on the B side was cover of a gay (or at least bi)-themed song from 1976, “Criminal World.” Was this a communique of sorts, a “psst–I’m still here” note from a converso? Or just one last twist of the knife? Justin Bond, to Marc Spitz. I think I see beneath your mink coat. and replaced the lines with some weak phrases, apparently his own. Then, in the second verse, Bowie changed “I saw you kneeling at my brother’s door” to “you caught me kneeling at your sister’s door.” He turned a gay-themed line into one that Vince Neil could’ve written. There was no excuse for this. A decade before, Bowie had written “Sweet Head” and “Velvet Goldmine,” had put out “John I’m Only Dancing” as a single. Now he’s bowdlerizing a mild, vaguely-bi obscurity, cutting out any language that could possibly upset some square in Dubuque? The “Criminal World” remake is a pretty solid track. Nile Rodgers did a variation of his “China Girl” riff, a little bouncing movement on the the high strings of his guitar, and after the chorus the stomping riff of the Hollies’ “Long Cool Woman in a Black Dress” sneaks in. Tony Thompson is solid as always, while Carmine Rojas’ bass, with its low, drooping slides, is the lead instrument whenever Stevie Ray Vaughan is absent. Vaughan gets two typically exuberant solos (though they seem staid compared with the wild, abrasive guitar on the original Metro track). It’s the best track on a mediocre side. But why is it even there? As with “Ricochet,” there’s a sense that Bowie is including some domesticated versions of his past work in his new all-ages record. It’s subversion turned to mummery, it’s a formerly fearless man bluntly hedging his bets. It’s a mistake, an insult, one of his least noble moments. Recorded ca. 1-20 December 1982, at the Power Station NYC. * Both Browne and Godwin had bigger hits as solo acts in the Eighties: Godwin’s “Images of Heaven” and Browne’s “The Wild Places.” Browne died of cancer in 1993. 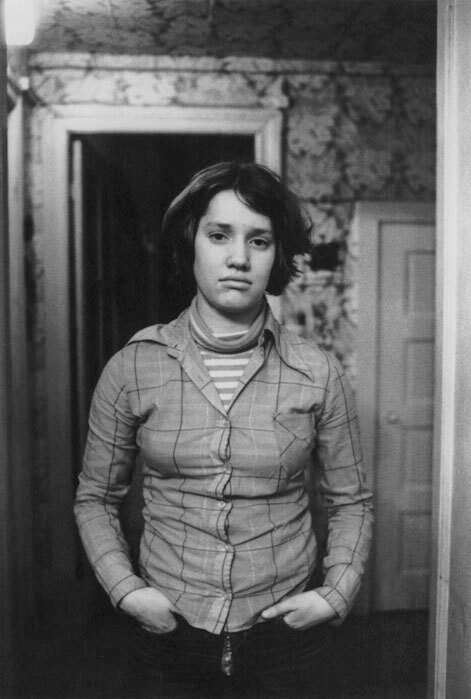 Photos: Helga Paris, “Pauer” and “Gabi,” from the series “Berlin Youth,” 1982. Ricochet (portion of tour film). As Genesis evolved from a progressive rock theatrical troupe into Phil Collins’ off-year backing band, the remaining trio of Collins, Mike Rutherford and Tony Banks offered a meager recompense: each new Genesis record, no matter how much schlock it contained, still had at least one “prog” track for old times’ sake. These mainly served to irritate new fans and disappoint old ones. That Rodgers, a man who likely blows his nose in perfect time, was flummoxed by “Ricochet” shows how awkward a composition it is. As no demos or outtakes from the Let’s Dance sessions have surfaced, it’s hard to guess at how the track developed in the studio (it seems like it was a struggle—the singer Frank Simms recalled “Ricochet” having the most difficult vocals to master). The final track’s bass and drums are locked in place, as if cast in iron. The drum pattern, nearly unchanging throughout the track’s five-minute-plus length, is a snare hit on the first beat (+ a crash cymbal on every other bar), two bass drum hits on the third beat and four triplets played on the hi-hat. The bassist generally plays four quarter notes per bar: low root, octave jump, two more low roots. Yet there’s no weight or presence in this repetition. The beats quickly dissipate in the mix: the bass drum, altered and probably gated, is nearly interchangeable with the gated snare and the combination of the two sounds more like arcade game incidental music than any grim “march of time” that Bowie may have envisioned. (Only later in the track, with the appearance of Sammy Figueroa’s bongos and an occasional needling Rodgers guitar part, is there any variation). The rest of the musicians are colliding or turning up at odd moments: the saxophones seem to have wandered in from a jazz fusion session in an adjacent studio, Stevie Ray Vaughan ducks in only at the fade and the Simms brothers (and David Spinner) on backing vocals repeatedly go over the top, from the choral harmonies in the last refrains to the Manhattan Transfer-esque “RI-co-chet it’s-not-the-end-of-the-WURRLD” free-time tag. Its title a possible play off Marc Bolan’s “Spaceball Ricochet,” the lyric is Bowie’s most ambitious on the record, though leaden and awkward in parts, especially the spoken lines (“Modern Love” is far more disturbing and cutting). A take on unemployment, the callousness of late capitalism or some jumble of the same, it offers either surrender or a vague humanist hope as a resolution. 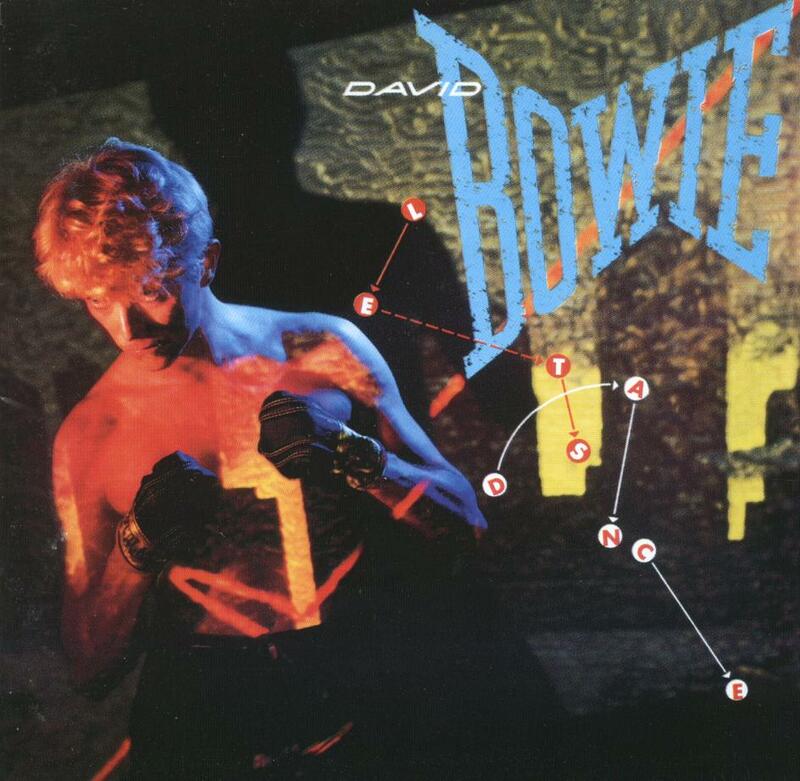 The title suggests that Bowie’s main theme is collateral cultural damage—a ricochet, after all, is what happens when someone misses a target, and there’s the sense that the beaten-down men in the song are just drive-by casualties of some broader game. Bleak enough sentiments for 1983. But as with “Repetition” and some other upcoming “topical” songs of the Eighties, Bowie seems to have no clue as to how ordinary working people live, and so draws on plays, novels or newspaper articles for stock footage (“dreaming of tramlines, factories, pieces of machinery, mine shafts, things like that”). There’s more at stake in Bowie’s songs about aliens and supermen, more heart in the lines that Bowie pasted together via cut-ups. An artist whose primary muse and subject was himself, Bowie often went missing when attempting to plumb the common world, though this growing (and at times desperate) need for connection would drive much of his later work. A fairly standard composition that travels through the basic stops of D major, its long bridge/refrain muddies things slightly with a suggested move to A minor. But “Ricochet” plods more than it develops, not helped by the identical chord progressions of the 8-bar bridge and the refrain and a two-minute draggy coda stalled in A minor. The nursery rhyme-like refrain (“march of flowers, march of dimes,” etc) is a simple three-note descending phrase, while Bowie’s vocal on the verses mainly keeps to his lower register. I’ve no clue who did the Scottish [edit: Welsh? ]-sounding muttered vocal cycling through the track—it’s possibly Bowie’s voice altered beyond recognition, but it’s more likely a backing singer. The closing line “who can bear to be forgotten” is a near-steal from WH Auden’s “Night Mail,” as are a few others (compare Bowie’s “Men wait for news while thousands are still asleep” to Auden’s “men long for news“). “Night Mail” seems key to the whole track, as “Richochet”‘s refrain’s meter is the same as Auden’s verses, and the former’s ungainly rhythm seems an attempt to imitate the sound of a juddering train. * Bowie, throughout the Eighties, would promote a new record by first admitting the previous few had been crap. This 1987 interview in Musician, where Bowie tore apart Tonight and didn’t have much good to say about Let’s Dance, was done to promote Never Let Me Down, a record that Bowie subsequently disowned. See also: Mick Jagger. 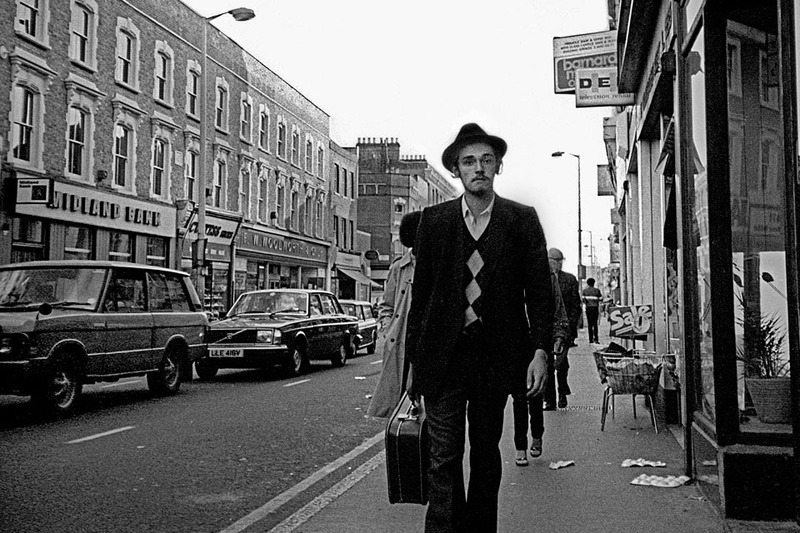 Top: Alan Denney, “Stoke Newington High Street,” 1983. The Myth (Giorgio Moroder with David Bowie). 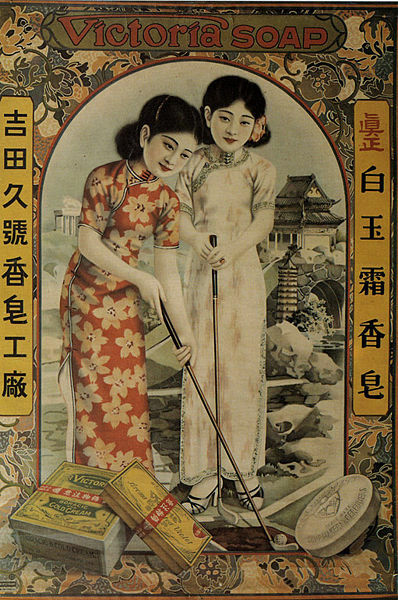 Cat People (Putting Out Fire) (single). Cat People (Putting Out Fire) (LP remake). Cat People (Putting Out Fire) (live, 1983). Cat People (single edit, Inglourious Basterds, 2009). The Lennon murder ended any chance of that. Bowie fled New York soon after the New Year, returning to Switzerland. 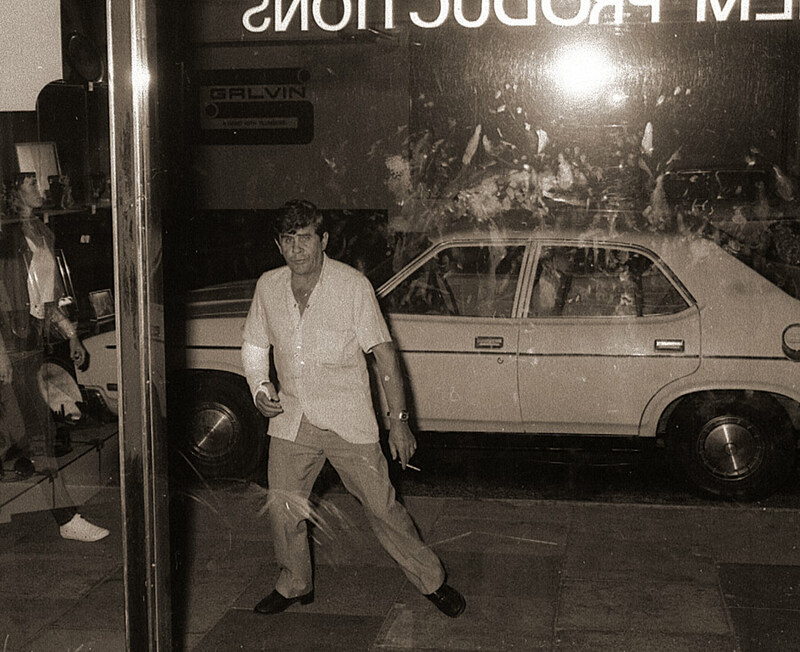 There, in Coursier-sur-Vevey, Bowie hired an ex-Navy SEAL bodyguard and took classes in self-defense for celebrities, learning how to identify potential stalkers (he was advised to move, as some fans had found his address—this would be his last summer in Vevey). He skied, entertained Charlie Chaplin’s son and widow, doted on his 10-year old son. With the exception of a brief trip to London to accept an award, Bowie stayed in his Swiss exile, living like a well-apportioned hermit. He didn’t want to record new material, either. Bowie had soured on RCA, which he blamed for poorly promoting his late Seventies records* while flooding the market with repackages like ChangesTwoBowie. Also, he still had contractual obligations to Tony Defries that wouldn’t expire until October 1982: Bowie hated that his old manager was still owed a piece of his mechanical royalties (it’s one reason Queen put out “Under Pressure,” a song he partially wrote, on their label and with a headline credit—that way Defries wouldn’t get a cut of it). Having only one more album on his RCA contract and almost clear of Defries, Bowie determined to wait everyone out. 1981 would be a deliberately lost year. Well, not entirely. Paul Schrader had asked Bowie to work with Giorgio Moroder on the title song for Schrader’s garish remake of Cat People. In the summer of 1981, Bowie went to Mountain Studios in Montreux to meet Moroder, whose music he had enjoyed since Moroder’s Donna Summer productions. Moroder played him a moody three-chord piece he had worked up for the title theme, a slow builder that would have Bowie sing the opening two verses in his lowest register, then suddenly vault up to spark the refrain. Val Lewton/Jacques Tourneur’s Cat People (1942) is an eerie, wonderfully weird picture in which the (generally) off-screen monsters are shadow metaphors for frigidity, repression, xenophobia (an “all-American” guy marries a foreign girl whose “Old Country” past is dark and potentially lethal). 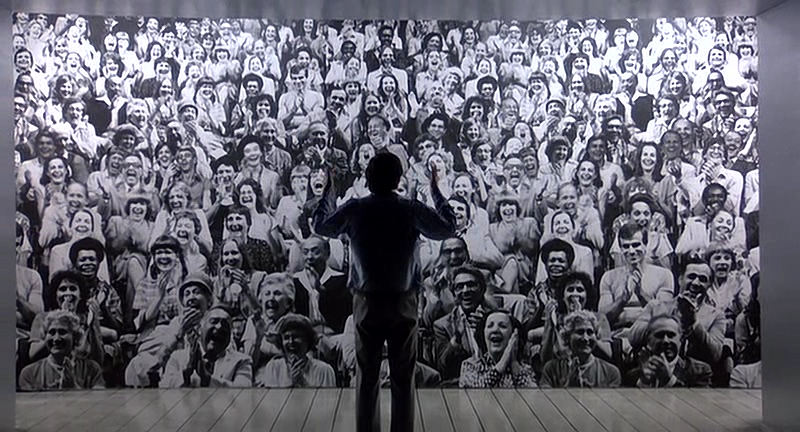 It was far too nuanced for 1981. Schrader, taking the title and a handful of plot details and scenes from the original, turned Cat People into a bloodfest that he shot like a fashion spread. Cat People was an excuse for Schrader to shoot Nastassja Kinski, with whom he was infatuated, as often and as naked as possible, these scenes occasionally punctuated by gore-pieces, like Malcolm McDowell (Kinski’s cat-brother, who wants to mate with her: “we are an incestuous race,” he intones in a dream sequence) tearing off Ed Begley Jr.’s arm in a spray of blood. It didn’t matter, because the sound-picture Moroder created for Bowie gave him the license to go gloriously over the top. Bowie’s sepulchral croon in the opening verses (it seems like a near-parody of Jim Morrison at times) plays against Moroder’s minimalist percussive tracks—a repeating cymbal pattern, clattered sticks—and droning, yearning synth lines. And the sudden octave-leaping explosion of “putting out fire….WITH GAS-OH-LIIIIIIIIIIIIIIINE!” that triggers the “full band” entrance is a magnificent moment, giving Bowie such presence that everything that follows, everything stupid and campy about the song (and there’s lots), is just burned away—Bowie rips into lines like “it’s been so long” or “you wouldn’t believe what I’ve BEEN THROUGH” as in a fever. 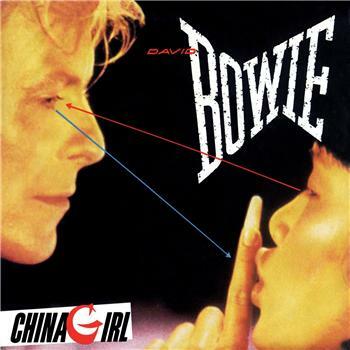 The track goes on far too long, the backing singers eventually try to defuse Bowie, but there’s a lurid, pulp power to the track—the film it’s scored for seems unworthy of it. Nearly two decades later, “Cat People” found its true role, used by Quentin Tarantino in Inglourious Basterds for a sequence that reveals the plans of the Jewish avenger Shoshanna Dreyfus (Mélanie Laurent) to condemn and massacre a cinema full of Nazis. Used here, lines like “it’s been so long” or “judgement made can never bend” suddenly sharpened, gained bloody, righteous purpose. 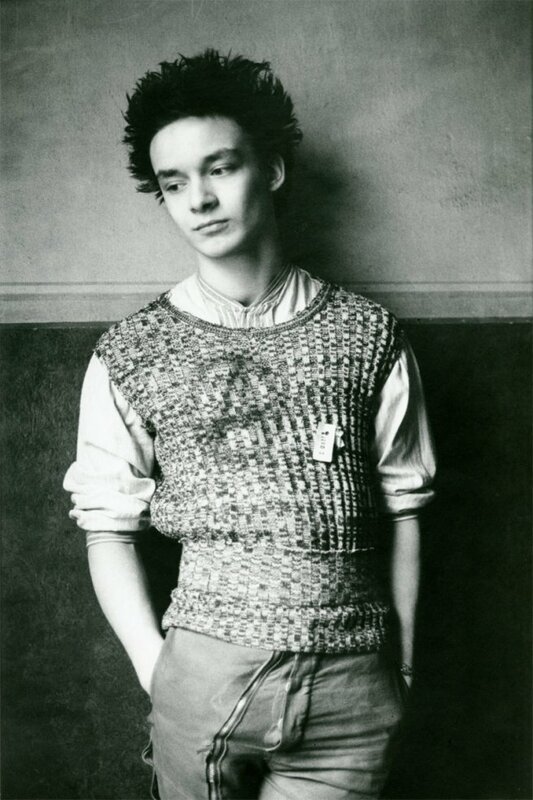 “Cat People” now seems written for Laurent, who was born two years after it was recorded; in her, the song finally found its muse. 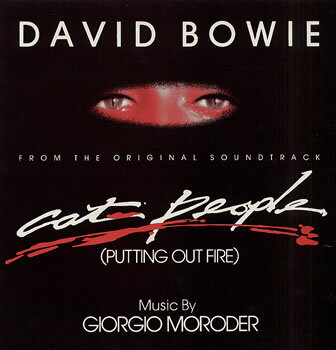 Moroder’s soundtrack for Cat People (he performed all tracks solo save Bowie’s theme song, which only appeared in the end credits) followed the formula Moroder had perfected in his American Gigolo soundtrack—have a hit single as the centerpiece, then write variations around it (like the various incarnations of Blondie’s “Call Me” in Gigolo). So Cat People opened with a brooding instrumental version of the title theme, called “The Myth,” featuring some ominous Bowie humming. 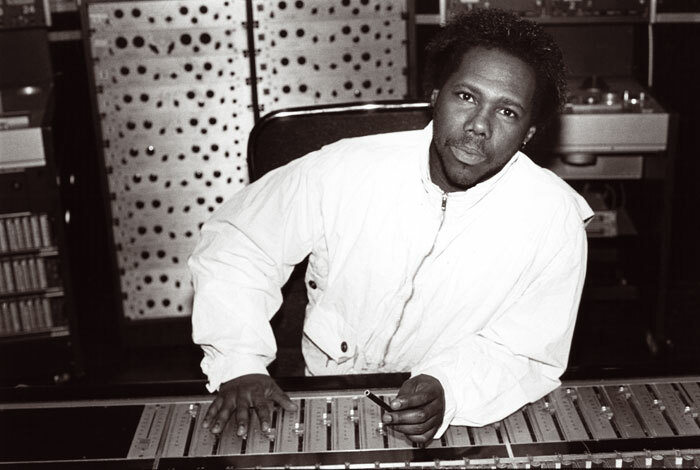 Due to rights issues with MCA, Bowie couldn’t include the Moroder “Cat People” on his first record for EMI, as he had wanted, forcing him to remake the song with Nile Rodgers in New York. 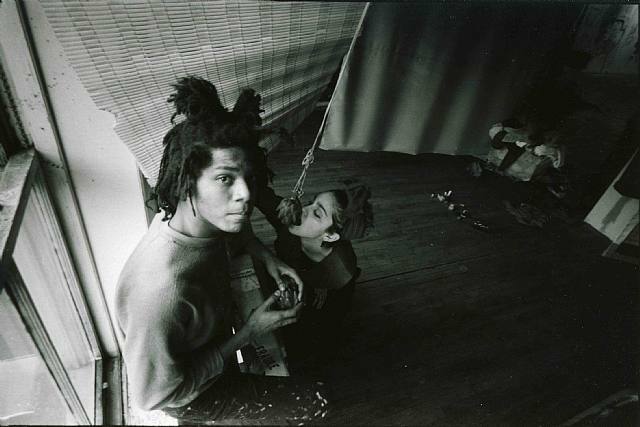 A collective lack of enthusiasm is audible on the second “Cat People,” which at times seems a deliberate ruination of the song, with Bowie and Rodgers botching everything great about the original (Bowie’s initial vocal leap is way too rushed here, while the drumming, by either Omar Hakim or Tony Thompson, kicks in far too early, and mixed in the stadium-ready gated sound of the Power Station). Stevie Ray Vaughan’s guitar overdubs seem superfluous compared to the minimalist work of Moroder or whichever anonymous session musician played on the original. Recorded July 1981, Mountain Studios, Montreux, Switzerland (Moroder seems to have played much of the track, though the saxophonist David Woodford said he played on some of the Cat People material). First issued as a single in March 1982 (MCAT 770, both 7″ and 12″ versions, #26 UK) and on Moroder’s Cat People original soundtrack. 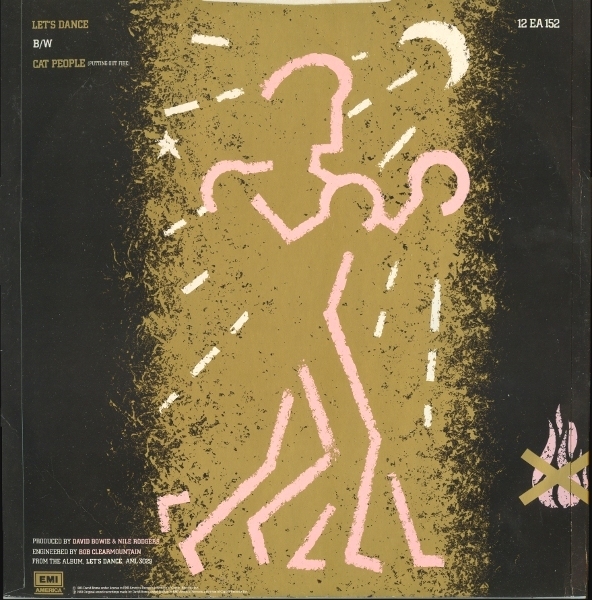 The remake was cut at the Power Station, December 1982; on Let’s Dance, and also a B-side to the title track. Played live only during the Serious Moonlight tour, 1983. 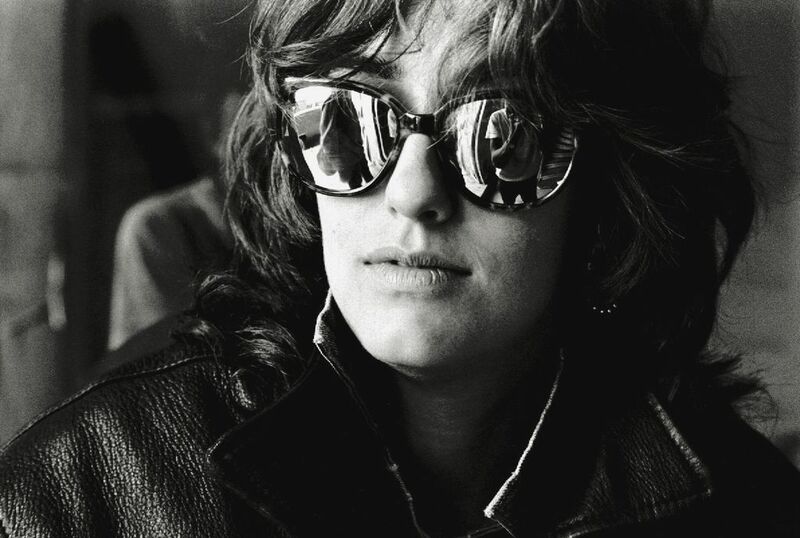 Top: ‘interieurblue,” “Sunglasses Mirror,” Paris, 1981. You are currently browsing the archives for the Let’s Dance: 1983 category.